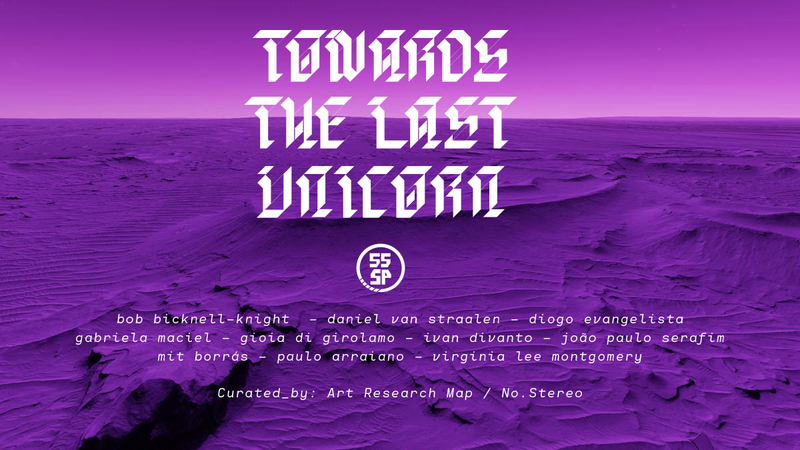 55SP presents ‘Towards the Last Unicorn’, an exhibition co-curated by no.stereo and Art Research Map. A group of artists has been invited to show works that will be both on display at 55SP (physical space) but also online. In these, the immaterial media becomes the message and the messenger for a return to the matter. New paradigms of lifestyle have been imposed on globalized societies. Avoidance of disconnection and technology equals the risk of entering a system of non-belonging. Hence, how does one not belong, when by belonging we must refer (now) to a state of human absorption through devices and screens? How are we thinking or rethinking the sensorial approach to the world we live in? Is it becoming merely visual? And therefore, should we name the digital attention span, progress? There is an urgency to rethink what it means to be human now. And so, the importance of our bodies as the singular potency of creation. Contemporary artists are manifesting the transformation of mind into matter, rethinking our ecosystem, both internal and external, as a new way of belonging. The question remains on the viable direction in which to move. As we can only move forward, perhaps this movement means a new ecology and the refusal of a time stealing continuum. It means the creation of awareness. ‘Towards the last Unicorn’ leads us in a direction and that includes the three times – present, past and future. Also, it implies a motion as the present is the possibility to be the catalyst and the kairós. The unicorn is this mythical creature with magical powers, which pervades in our imaginary as something that might or might not exist. It is magical thinking transformed into a symbol, an emoji, a figure with cultural connotations, which still inhabits a thought of possibility linking our present to the past and future. The video immateriality comes from a very tactile manipulation and, moreover, it implies duration and the time to be seen. ‘Towards the Last Unicorn’, is the last call to the awareness of time and matter, away from a dystopian digital absorption, using this same digital media as a source of communication. artists: Bob Bicknell-Knight, Daniel van Straalen, Diogo Evangelista, Gabriela Maciel, Gioia di Girolamo, Ivan Divanto, João Paulo Serafim, Mit Borrás, Paulo Arraiano, Virginia Lee Montgomery.